Canned Alaska Salmon adds easy, excellent protein to any meal-Just open the can to one of the finest foods on the planet. Use canned salmon rather than tuna, crab or even chicken breast in your family favorite recipes. For example, risotto or roasted vegetables. Are delicious side dishes that need a little bump up in protein to make a meal. Canned salmon complements both deliciously with very little ado. Less elegant, but just as delicious to many, canned salmon added to boxed mac and cheese really improves the nutrition of this kid-favorite. Even more simply, pile canned salmon on salad greens or put it on your bread of choice along with a little cream cheese—it is great just straight out of the can. The possibilities are endless. 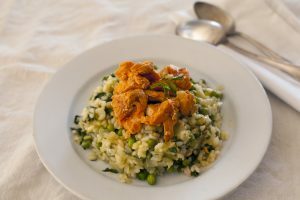 One of our most stunning recipes, Fabulous Wild Salmon Curry Salad, is a recipe adapted from one calling for chicken breast. This recipe never fails to impress, and we have served it to literally thousands of people in food shows and at in-store demonstrations. Canned Alaska salmon + almonds, raisins + apples + curry? = DELICIOUS! There are thousands of crab cake recipes from the most simple to gourmet. Many celebrated chefs have their own version of crab cake, and I have found that using canned salmon in these gourmet recipes makes a very fine substitute yielding exquisite results at far less cost and more nutrition. Think Pink wild pink salmon, works just fine in salmon-crab cakes recipes. Freezing uncooked salmon cakes for easy dinners later on couldn’t be easier. Form uncooked salmon cakes, wrap securely and freeze. When you are ready for that delicious meal, pop the frozen, uncooked salmon cake in a 425 degree oven for 20-25 minutes, turning once. Make a quick salad and you’ve got dinner. 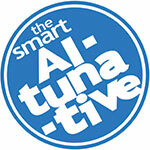 There is a reason we coined the term, The Smart Al-Tuna-tive, because canned wild Alaska salmon can be used interchangeably with tuna. Canned pink salmon, the most economical choice, looks just like tuna and is often indistinguishable in taste from the finest albacore. Be sure and include the nutritious and flavorful skin and bone found in the traditional pack salmon in all your recipes. The skin and bone, when lightly mixed and mashed, seems to disappear into the recipe. We have served samples to literally thousands of people and when in a recipe, not a single person has identified the presence of skin and bone while adding tremendous nutrition. The skin and fatty layer underneath are very rich in long chain omega-3 fatty acids. You can combine canned salmon with other types of fish, such as in Salmon & Shrimp Cakes with Double Radish Sauce. When hiking or picnicking, we make our sandwich with frozen bread. The frozen bread or bagel helps to keep the salmon cool. Thinking really ahead we refrigerate the unopened can of salmon for an added chill. We’ve long noticed that a salmon lunch infused us with a unique and positive flow of energy all day long. Our mood and ability to cope with stress was improved, while our thinking seemed more clear. Over the years friends and customers report a similar experience. Take a stack of cans to the office, and no matter what, you’ve always got lunch!